Defence Structures constructed during the War Early 1940 was Britain's darkest hour - the Germans were preparing to launch a massive invasion. Nobody knew where the enemy would strike first. The South and South East coast was a prime target and little seemed to stand in the Germans' way. "We shall never surrender"
Everyone remembers Churchill telling the nation, "we shall fight them on the beaches, we shall fight in the streets, we shall never surrender." "Operation Sealion" was the codename used by the Germans for the invasion of England. When this was apparent Churchill would issue the codename "Cromwell" to all our UK forces indicating "Invasion Imminent"
What most people don't know is that Churchill was worried that the nation didn't have enough defences to back up his rhetoric. Following his speech, there was the biggest military building programme in British history. The mission was to make the country an impregnable fortress. Hundreds of defences, tank traps and gun batteries were thrown up frantically in just a few months along the coast of Britain. A Pillbox was constructed every 20 minutes during this building programme. Most pill boxes comprised a small room of about ten feet square and six feet high with walls of thick rough concrete with a door, over which a sheet was often draped. They were basically a type of dug-out or bunker with look-outs and small slits for machine guns.Each box was linked to the next by defensive ditches deep enough to stop a tank, or by natural features such as embankments, rivers and canals. They were normally intended for a garrison of from one up to ten men who would have been armed with rifles, light or heavy machine guns or small anti tank weapons depending on location. Some were equipped with a mounting to use one or more machine guns in an anti aircraft role. It was envisaged that they would be part of more comprehensive defensive lines, often based on rivers and rail lines.. They were built by local construction companies to a specific design (Type 22, 23 etc) which were often further modified to suit a particular site. They were sited to cover road junctions, river crossings and other important places. It was also usual to site them to give each other covering fire when they were in a group or within site of each other. 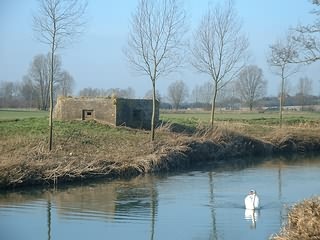 A prime example of this are the pill boxes along the River Stour where some are only 350 yds apart.After the war these defences were left to decay and rot, and many of them became overgrown.Farmers were offered a demolition fee of £5 per pill box but demolition was often more trouble than it was worth. As a result hundreds of pill boxes remain derelict in the countryside. 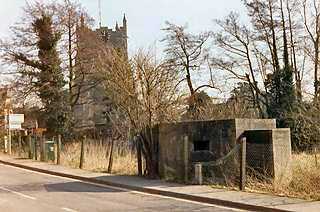 The pillbox at the bridge formed part of the defensive network called the `Eastern Command Line`. A rather English version of the French and German stop lines used during the two world wars. The majority of the work to complete this line was completed by 1940. 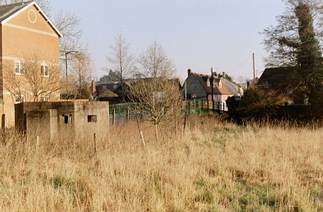 An informed estimate gives an approximate total of 28,000 pillboxes built in the United Kingdom during the Second World War, possibly some 21% survive today. This line was the first inland defence line or "stop-line" to be met by a German force driving in from the NE Essex coast. This was a defensive position which originated at the mouth of the River Colne at Mersea Island. Using the River Colne as an anti-tank barrier it ran north to Colchester. The capture of Colchester was unthinkable. The loss of an army barracks, communication site and a garrison town would have been a major disaster for the British. From Colchester, the line continued to follow the Colne west to Chappel Viaduct. Here it headed north along the railway embankment to Bures. It then joined the river Stour to exit the County north of Sudbury. There were 198 recorded boxes along this Eastern Command Line, approx 90 still survive in 1998. Apart from Pill Boxes the line was reinforced with anti-tank measures. These made use of natural features such as rivers, woods and marshes. Where no natural barrier is available man made barriers were constructed such as ditches and concrete obstacles to impede their progress. The roadbridge in the village was mined with explosives on the supports, these would to be detonated and the bridge destroyed in the event of an approaching German Army. Two concrete tank traps were placed either side of the bridge in its centre making the roadway single lane.